After introducing ImageRecycle’s capabilities to minimize the size of your WordPress image files, lazy loading goes the extra step to optimize user experience. Lazy loading delivers the images that your users need only if and when they need them, greatly improving performance on mobile devices. How does that work? Lazy loading brings your content to life, intelligently adapting to what the user can see. For example, if someone is visiting your WordPress blog from a mobile device, the screen size greatly restricts visibility. It makes no sense to load all images when users can only see a few of them, especially if they end up exiting the website before seeing all the content. Lazy loading loads images only when users get to them. If they’re on a post or page and they can only see one image, that is all that loads. As they scroll, images load gradually, taking nothing away from the experience, while increasing loading times and reducing data usage on mobile. 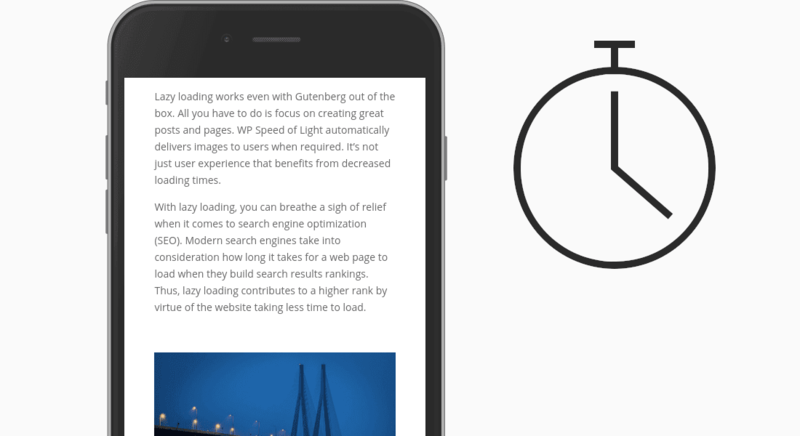 It’s not just user experience that benefits from decreased loading times. With lazy loading, you can also breathe a sigh of relief when it comes to search engine optimization. Modern search engines take into consideration how long it takes for a web page to load when they build search results rankings. Thus, lazy loading contributes to a higher rank by virtue of the website’s rapid loading times. 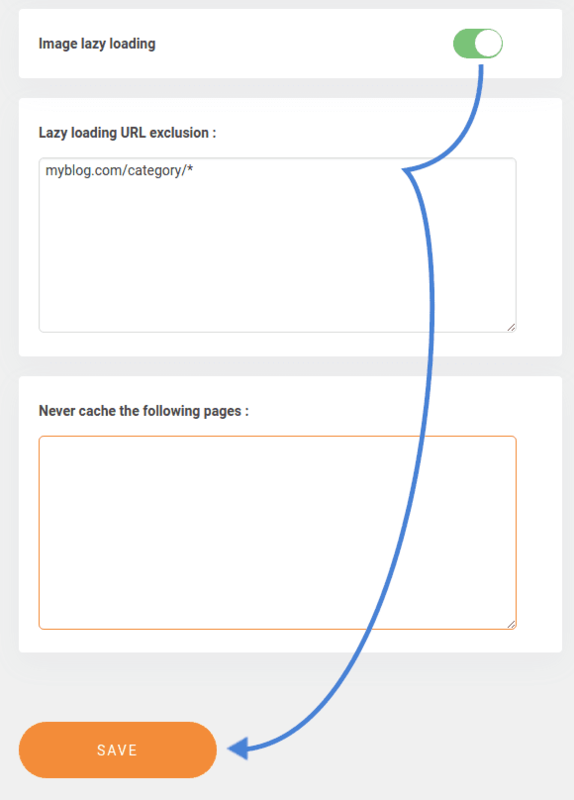 So then, how do you enable lazy loading on WordPress? 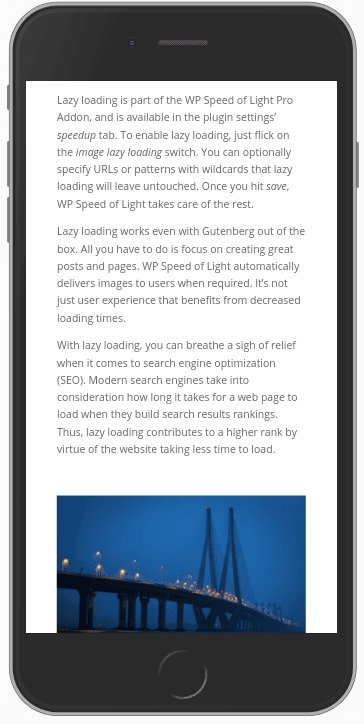 Lazy loading is part of the WP Speed of Light Pro Addon, and is available in the plugin settings’ speedup tab. To enable lazy loading, just flick on the image lazy loading switch. You can optionally specify URLs or patterns with wildcards that lazy loading will leave untouched. Once you hit save, WP Speed of Light takes care of the rest. Lazy loading works even with Gutenberg out of the box. Whatever editor you use, all you have to do is focus on creating great posts and pages. WP Speed of Light automatically delivers images to users when required. There are only winners in lazy loading. All readers get their content earlier, mobile users save on data usage and your WordPress blog climbs the ranks in search engines. With the WP Speed of Light Pro Addon, you too can benefit from lazy loading with the flick of a switch.